With fall officially underway (at least here in the Pacific NW) I thought I would add another comforting soup recipe to my collection. 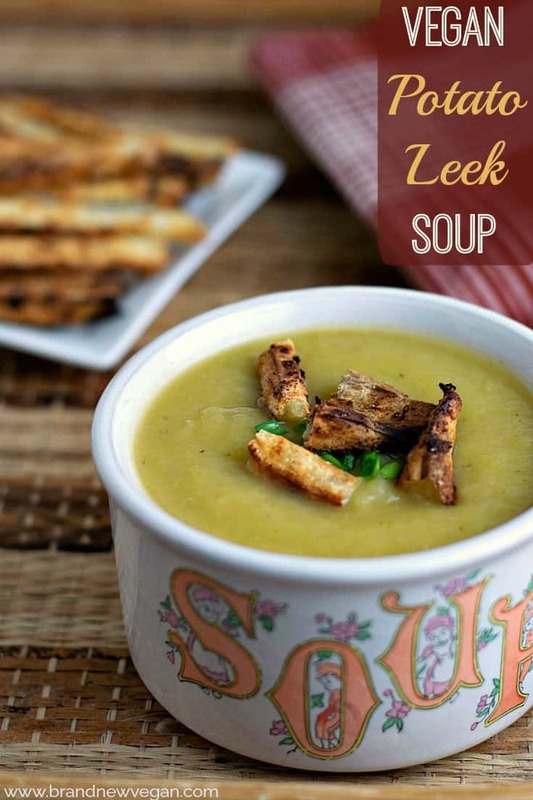 And what could be more comforting than a nice hot bowl of Potato Leek Soup? Plus there’s the fact that I already had 2 recipe fails this week and “I” needed something fast and delicious too! 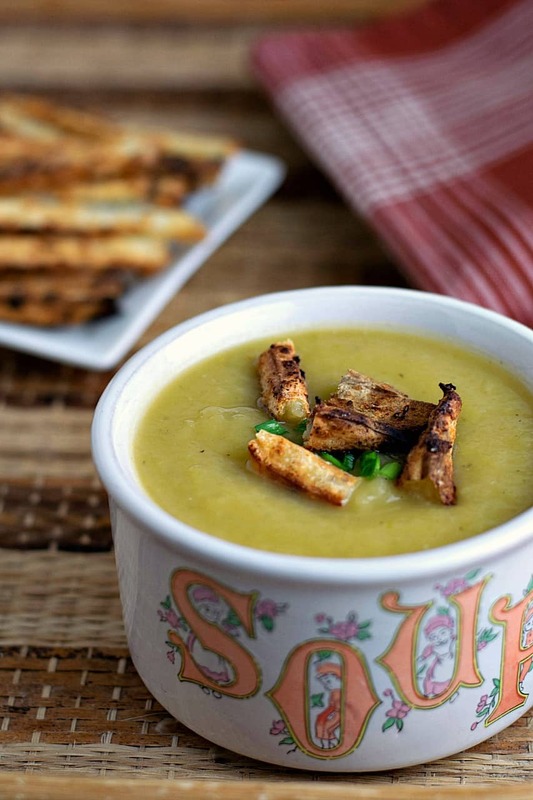 This Vegan Potato Leek Soup is just the thing. One pot is all you need, with a couple of potatoes, a couple of leeks, and a carton of Veg Broth. But if you REALLY want to take it up a notch – crumble up a few crispy french fries on top, with just a little dollop of my Green Chile Sour Cream? Ok – enough of the ‘blah blah blah’ many of you said you don’t read anyway….. but if you have read down this far …. what movie does that come from? We’re going to start by cleaning up 2 large leeks. Cut off the root end, then turn it around and leave about an inch of the dark green leaves and cut off the rest. You should be left with the white/light green part with about an inch of the dark green. Slice these in half lengthwise (from root to tip) and then slice crosswise into 3/8″ ribbons. Try to keep them all about the same size so they cook evenly. Place all the chopped leeks into a bowl of cold water and really swish them around as a lot of dirt and grime hide in between all those layers. Drain the leeks and add to a large soup pot. Add just enough veg broth to keep them from sticking and begin to saute the leeks until really, really, softened. This will take about 10-15 minutes. Add 1 clove of minced garlic right before the leeks have finished softening. and give them a quick stir. Meanwhile peel 2 large, baking size Russet Potatoes (Yukon Golds would be really good too but I would add a 3rd potato) and then cut them into similar sized cubes. Once the leeks have become almost like mush, add your cubed potatoes and 4 cups of low sodium veg broth. Season with salt, pepper, and thyme and add 2 Bay Leaves. Bring to a low boil, then reduce the heat to a simmer and cover. Let that simmer about 15-20 minutes or until the potatoes are super soft. Now I said no fancy equipment was required, but I happen to have an immersion blender so I used that to blend my soup. If you don’t have one you could easily transfer a few cups at a time to your regular blender until the whole soup is pureed and very smooth. You can leave it chunky too if that’s what you like. and if it’s too thick – just add a little more broth or water. Once it’s blended, take a taste and adjust any seasonings. It will probably need a bit more salt, so add that to your own taste. I also added 1 tsp of Vegan Worcestershire Sauce at this point for a little more flavor. 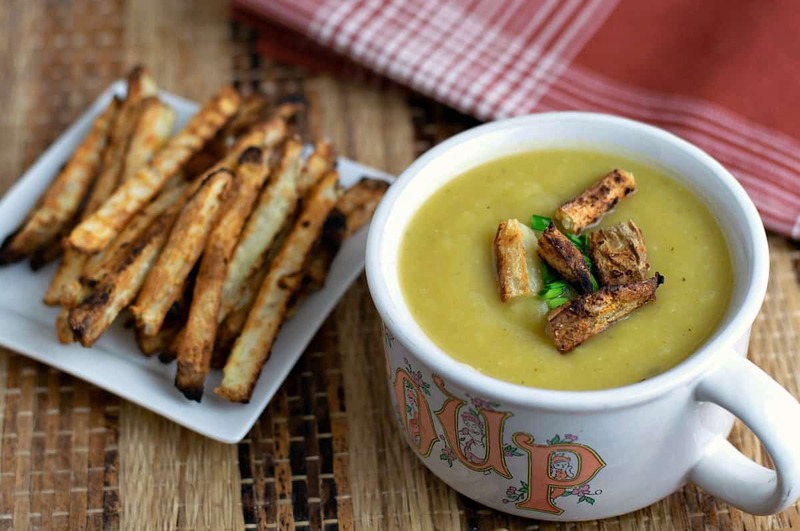 I garnished my soup with some fresh chives and a few french fries from my air-fryer for crunch. As I said above – a big dollop of my Green Chile Sour Cream adds a whole additional layer of flavor – but I’ll leave that optional. And for those of you who are thinking of trying your first (or maybe another) Mary’s Mini Potato Diet – this soup is absolutely compliant. Thanks for the recipe. 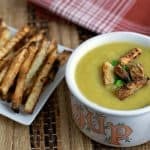 Was looking for a vegan potato leek soup recipe today and this landed in my inbox! Will try it soon. I really love your recipes. 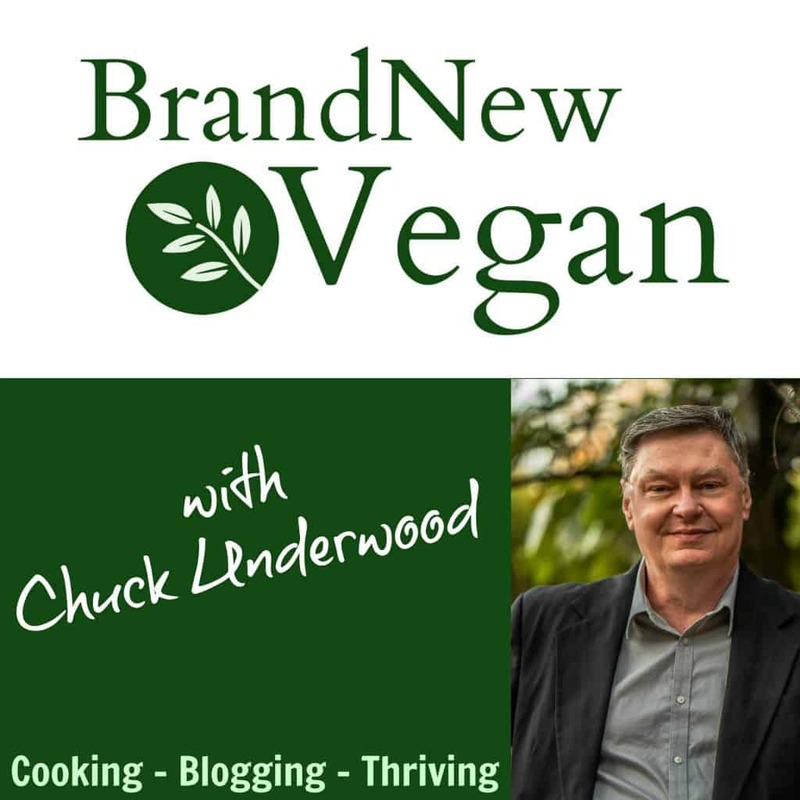 We have gone vegan, and your recipes are truly delicious! I receive your emails so, thank you! I don’t know the movie, but want you to know I read all of your notes all the way through. I appreciate and enjoy your sense of humor and the way you present your recipes to us. Keep up the good work! Just one comment on this recipe. Please note to remove the bay leaves before eating or blending. I’m having this for dinner tonight! I made this in my InstantPot. I dumped it all in and used “manual” for 5 minutes. Used 10 minute quick pressure release. Made this tonight and it’s so delicious! It was our first time making soup and first time cooking with leeks, but the directions were so easy to follow. It turned out great, we will definitely be making it again. Thanks! Whoops totally forgot to fish out the bay leaves before blending! Smells so good in my house right now can’t wait to eat this. This is probably one of the best soups I’ve ever made! I followed pretty close to the recipe, just added a few stalks of celery to use them up and also didn’t have any worchestershire sauce so had to improvise with an online recipe (just threw the ingredients from this recipe https://www.marthastewart.com/258132/homemade-vegan-worcestershire-sauce although I just threw a pinch/dash of each ingredient straight into the soup after blending). I used yukon gold for this and it is glorious. I’ve almost eaten the whole pot in the past hour! Thanks for the recipe brandnewvegan!